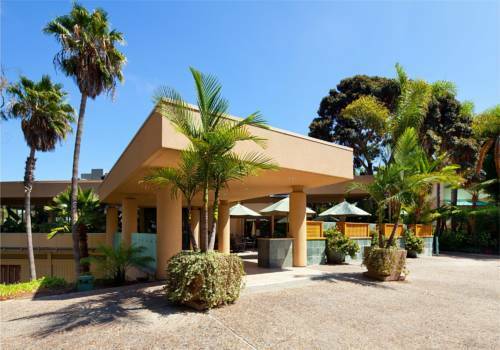 Set in picturesque La Jolla, California, the Sheraton La Jolla welcomes you to enjoy nearby beaches, La Jolla Cove, Torrey Pines Golf Course and popular San Diego attractions such as the San Diego Zoo, Balboa Park, LEGOLAND and USS Midway. The hotel is conveniently located near the University of California San Diego, as well as some of the most renowned hospitals and research facilities in the world. Were also located within 5 miles of some of the best independent craft breweries and distilleries in the nation. Within steps of the hotel, visit Whole Foods, restaurants, movie theaters, coffee shops and more. Stroll through our 7.5 acres of lush, tropical gardens and manicured grounds with cascading waterfalls and Koi ponds. Take a dip in our heated outdoor pool. Maintain your workout routine in our state-of-the-art Sheraton Fitness Center. Treat yourself to on-site dining in the award-winning Humphreys La Jolla Grill or Shooter's Bar & Grill which features nightly entertainment. Humphreys La Jolla Grill: Enjoy fresh seafood and continental delicacies in the contemporary ambience of Humphreys La Jolla Grill. Shooters Bar and Grill: Gather with friends and colleagues for a light meal and great entertainment at Shooters Bar & Grill.